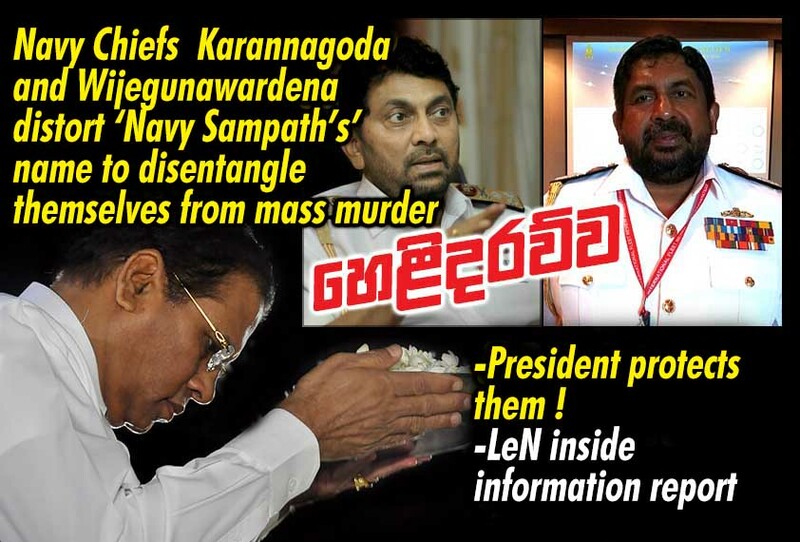 LEN - www.lankaenews.com | Navy Chiefs Karannagoda and Wijegunawardena distort ‘Navy Sampath’s’ name to disentangle themselves from mass murder -president protects them ! (Lanka e News -24.Aug.2018, 5'45AM) The incumbent president Pallewatte Gamarala is exerting pressures on the law enforcing Institutions precluding them from interrogating or arresting the present chief of security council Raveendra Wijegunaratne (former Navy Commander ) , and ex Navy commander Vasantha Karannagoda who aided and abetted the criminals in the gruesome murder of 11 innocent students after committing extortion. These two Navy chiefs were responsible for hiding the murderers and helping them to flee the country .It is a pity , the president Sirisena alias Sillysena by this unlawful action is rendering himself liable to violation of the constitution, according to reports reaching Lanka e news inside information division. Among the duties of the president under article 31 of the constitution , the president is not only bound to safeguard the constitution but also duly facilitate the activities of the Institutions afore-stated . Moreover, if president Gamarala is to hamper the activities of those law enforcing bodies , Gamarala will have to be behind bars the day his presidential immunity ends, for even if nobody takes that bold action , Lanka e News will be taking legal action against him in the best interests of the nation. Vasantha Karannagoda and Raveendra Wijegunaratne the two scoundrels have misled Gamarala into believing that Hettiarachi Mudiyansalage Prasad Chandana Hettiarachi alias ‘Navy Sampath’ who was directly involved and arrested earlier on is Munasinghe Arachige Don Nilantha Sampath Munasinghe to deliberately create a confusion . Karannagoda and Wijegunaratne are not only misleading the president but are holding media briefings enlisting their media coolies to portray a wrong picture that Navy Sampath is Sampath Munasinghe . Obviously , this is to disentangle themselves from these brutal murders and extortions , as they know too well of their own guilt and involvements in those crimes. Lanka e News hitherto identified the culprit Sampath Munasinghe by the name of “Navy Sampath’ , and that is unerring . Details are as follows …. During the time when Karannagoda was the Navy commander , Sampath Munasinghe was his ‘buddy’ and in Naval parlance ‘Flag officer’ . In case the Navy commander suddenly starts purging it is this flag officer who uses his both hands to fondle and fondly collect the stools. In other words Sampath Munasinghe and Karannagoda were extremely close like the buttocks and the loin cloth . However the relationship turned sour after Karannagoda came to know Sampath had an illicit affair with his wife. From that point of time , Karannagoda was conspiring to kill Sampath on the sly. It is then for the first time the evidence in regard to the abduction of the innocent children came to light. Sampath who feared that he will be murdered sought security through Sarath Fonseka the Army commander then . Sampath who met Fonseka made a long confession about the two teams and their crimes as well as other crimes which were committed with the knowledge and consent of Karannagoda .One team calling themselves as the special intelligence division was a murder squad operated under the then navy media spokesman D K.P. Dassanayake . Prasad Chandana Hettiarachi who committed murders and extortions, and was arrested earlier on was in the special murder squad of Dassanayake. In any event Fonseka entrusted the confession and the investigation to the CID at that time. Meanwhile Kaarannagoda lodged a complaint with the CCD which was then under Anura Senanayake . Later on both complaints were entrusted to the CID. The gruesome murder of innocent students is being investigated by the CID since that time . During the investigations it has come to light , Navy Sampath has identified himself as Hettiarachi Mudiyansalage Prasad Chandana Hettiiarachi . The name of Sampath Munasinghe having ‘Sampath’ in it is another story . It was Prasad Chandana Hettiarachi recently arrested who had chosen the name Navy Sampath in order to conceal his criminal involvements. It was thereafter via an official notification of the police seeking public assistance to apprehend Prasad Chandana Hettiarachi , Navy Sampath was identified definitely as Prasad Chandana Hettiarachi alias Navy Sampath . Though Prasad Chandana Hettiarachi alias Navy Sampath escaped in the Raviraj murder , it was he and his group that committed the murder of Raviraj. An extremely racist Sinhala jury saved the murderers after hearing a strange case until after midnight in a most weird manner Any way , Raviraj and his security police officer who were murdered in cold blood in broad daylight were not given back their lives. Surely these are victims who were murdered by these scoundrels , and not by beings from another planet . This brutal criminal Prasad Chandana Hettiarachi alias Navy Sampath is not only involved in the murder of Raviraj and 11 students but also in the murder of members of the Red Cross who were abducted from near the Railway station by the white Van, as well as several other crimes. Vasantha Karannagoda and Raveendra Wijegunaratne are criminals ! How? Now , Karannagoda and Raveendra Wijegunaratne have strong motive to confuse the identity of Navy Sampath for the obvious reason to save Prasad Chandana Hettiarachi the true Navy Sampath, because if and when the latter is found guilty , Karannagoda who used him to commit murders ,and Raveendra who gave him protection will automatically become wrongdoers. The other reason why Karannagoda is seeking to confirm Navy Sampath is Sampath Munasinghe , because Navy Sampath was having an illicit affair with Karannagoda’s wife , and therefore to avenge it. To prove Karannagoda is directly involved in the ghastly murder of the 11 individuals including innocent children , the letter issued by former minister Felix Perera alone is adequate. When Felix Perera phoned Karannagoda and inquired about these victims at that time , Karannagoda had said ,’I shall release them tomorrow’. His tomorrow that is, on the day following, all those abducted were killed and the bodies were drowned in mid ocean . This is clear and cogent evidence that Karannagoda must hold himself mainly and directly responsible for this mass murder .Felix Perera had openly exposed this , and the written evidence had been forwarded to court through the CID . There is also evidence that Raveendra Wijegunaratne provided security to Prasad Chandana Hettiarachi and gave him Rs. 500.000.00 to his hand before smuggling him out of the country . All these reports are with the courts. Therefore everything is crystal clear from the beginning to the end. The stories concocted to camouflage the scenario and take president Pallewatte Gamarala down the garden path in order to escape arrest cannot serve any useful purpose for there is cogent, concrete and copious evidence testifying to the true picture. All those have been reported to courts . President Gamarala who has currently made the executive powers impotent has to do only one thing now- allow room to enforce the law, and for justice to take its course without trying to protect the criminals .If the president despite this urgent and vital necessity to permit justice to be meted out in this mass ruthless murder , takes steps instead to the contrary to save the criminals , woe betide ! action can be taken against him under article 126 of the constitution because ,lest the president has forgotten , his presidential immunity has been limited by the 19 th amendment . The inequity Gamarala is presently engaging in outstrips the crimes even what notorious Gotabaya committed…. One more salient point must be made known in this regard. Goatbaya Rajapakse the then defense secretary stated, even he cannot save Vasantha Karannagoda the Navy commander in this heinous crime. It is a well and widely known fact that Gota is tainted with so many charges , yet in this instance he steered clear of these brutal murders , and instructed the DIG in charge of the CID to continue with the investigations duly without interruption. In the circumstances, the attempts made by president Gamarala to save Karannagoda and Wijegunaratne are crimes worse than what even most murderous ruthless Gota had been indulging in . It is well worth recalling , this is the president who sprang to the presidential seat after making most loud solemn promises that he would punish even the wrongdoers of the past , who is now outrageously and unlawfully shielding and safeguarding the criminals . Hence , the people must now decide what punishment must be meted out to this villainous president . It is very unfortunate this action of president Gamarala is going to earn wrath and disgrace for his entire seven generations of Gamaralas . Expect a comprehensive report of the 11 ghastly murders committed by the Navy murderers soon.